By the end of the nineteenth century not only medicine and science would have an impact but political and social changes as well. The imperial nations were in need of healthy and educated children. Maternal craft was essential. Social and racial progress was important for the welfare of its country. The idealization of motherhood was strengthened. And moral reform came around the corner. Now women needed to stay virtuous and religiously dutiful but now also sentimental. Passivity and altruism were the virtues of a good wife. Open expression of feelings and emotions were condemned. Women became frail and sickly because they were educated this way. A day in bed when menstruating was a minimum. Prudery was an obsession. Not a coincidence this came in a time where paternal authority were promoted by state and church. Not a coincidence this came with total submissiveness of women to husbands and maternal craft expertise. This is the time where extreme disciplinary education of children came to be. Mothers read Elizabeth Chesser’s books on Mothering craft where the ideals of personal vocation and racial and national progress were put together. To provide morality, chastity and a desire to be a superior race were to be provided by the mothers only and nobody could do that task better. Women were born to do so. A scientific interest was omnipresent and Child Science and The Mothering or Maternal Craft was born. 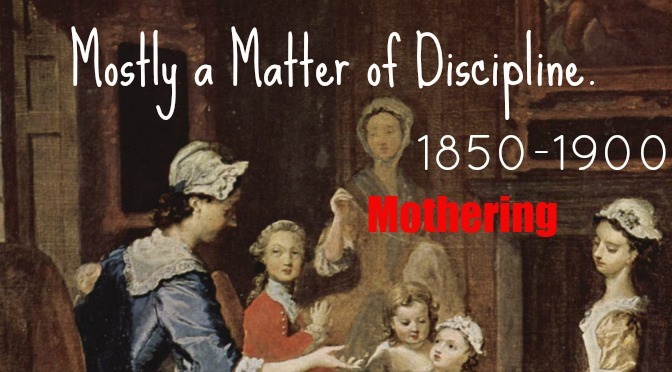 Motherhood was for the first time a ‘science’ that could be thought through courses. Important to note that the notion of maternal instincts, or natural bonds can not be further be removed. The Child Study Movement, the Child Study Association, the Childhood Society, and the Parents’ National Education Union were all bodies that emerged in this period. They emphasized for the first time the importance of the first year of a child and the possibilities within a child to be realized according only to specific childcare methods and the mothering or maternal craft. In America there was G. Stanley Hall the first American psychologist and also president of Clark University. He was the one who brought Freud to the US for his first visit and wrote many childcare manuals. He stressed the different development stages of children and the managerial tasks of the mother. Women had fought their way into college and the first college educated women started to graduate. And it was at the same time that society believed it was absolutely crucial to be college educated to be a mother. And so the diploma of ‘mother’ or the maternal craft was invented. The demands of education were getting so high one needed to study four years to prepare for motherhood. said Martha Carey Thomas, the American educator, suffragist, linguist, and President of Bryn Mawr College, in 1908. Of course it was too good to be true to be both educated and be a mother and stay at home. Nothing in a woman’s life was more important than motherhood. The cult of motherhood was peaking. The reasons were multiple but are imbedded in its society. There were Darwin’s ideas: The Origin of the Species was published in 1859. And colonialism and the ideas on quality of race to begin with. But the Romanticism and the importance of religion had an equally important influence on the matter of Motherhood. If you want to move into the first part of the 19th century, head over to the spiritual education style during 1800 and 1850.